The Festival of Mongolia was built on the idea of introducing the dynamic living culture of the people of Mongolia to Americans. Mr. Aziz Rahman, president of the Indo-Mongolian Society had since 1992 hoped to present a Mongolian Naadam celebration in Central Park with Mongolian wrestling and archery competitions along with traditional performing arts. Ambassador Jargalsaikhany Enkhsaikhan, Permanent Representative of Mongolia to the United Nations strongly supported the idea and allowed the Festival of Mongolia concept to become a reality. 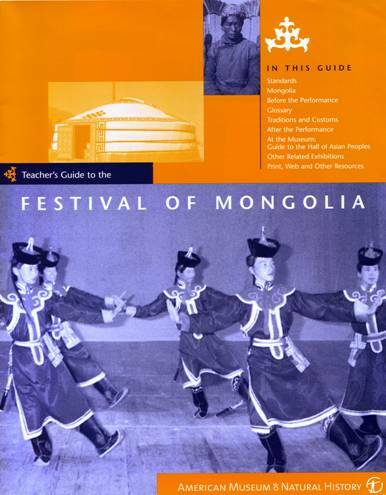 In the spring of 2000 the Festival of Mongolia presented a vast array of Mongolian cultural events including exhibitions, education programs and performing arts presentations. The American Museum of Natural History held a once in a lifetime exhibition of the Mongolian national treasure called "The Fighting Dinosaurs". The Metropolitan Museum of Art had special exhibition called, " The Iconography of the Mongolian Horse in Islamic Art", and the E & J Frankel Gallery had an exhibition of Mongolian contemporary art. 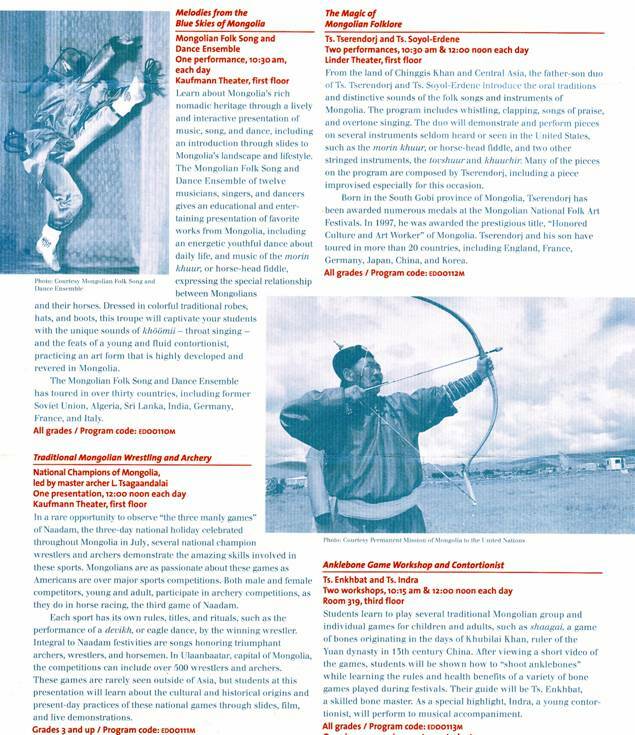 The American Museum of Natural History also presented a two week public program of performing arts including Mongolian wrestling, archery, music, dance, workshops, photography exhibitions and a Mongolian film festival. Asia Society featured an exhibition of Mongolian masks along with a lecture presentation on Mongolian and Korean Shamanism and a Mongolian music concert. 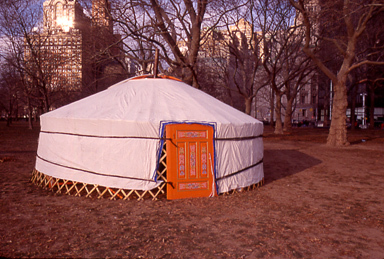 The Naadam was held for two days in Central Park and Mongolian Gers were placed onsite to convey the feel of a Mongolian nomad camp. Many thousands attended the events of the Festival of Mongolia in 2000, and by popular demand there was another Festival of Mongolia in 2001 and 2002. 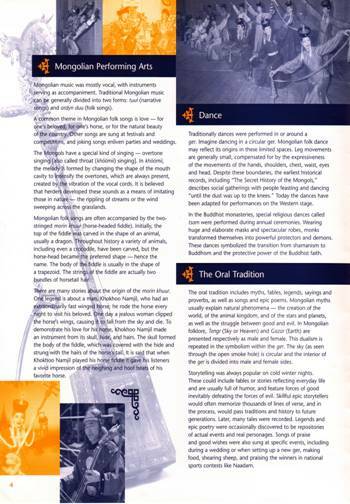 In the spring of the millennial year 2000, the living culture and historical contributions of the people of Mongolia were presented to the general public in New York City through a very large-scale cultural project called the Festival of Mongolia. The Festival of Mongolia concept was created and designed by Mr. Aziz Rahman, president of the Indo-Mongolian Society of New York, in 1991. The development of the project took seven years of planning and partnership with Ambassador Jargalsaikhany Enkhsaikhan, Permanent Representative of Mongolia to the United Nations, to bring to completion. Ambassador Enkhsaikhan contributed his remarkable abilities and enthusiasm for the goals of the Festival of Mongolia to help make the project an extraordinary success. The Festival of Mongolia exhibitions and programs drew on the historical contributions of Mongolia and its people to culture, art, world history and science to the world. 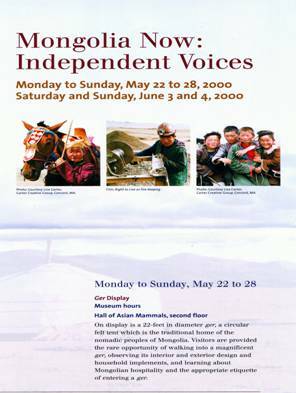 The Indo-Mongolian Society had illuminated many of these aspects of Mongolia's remarkable historical legacy through nearly a decade of Mongolia-focused lectures and cultural events held at New York University and elsewhere in New York City beginning in 1990. The Festival of Mongolia events, exhibitions and programs launched in 2000 in New York City comprised the largest celebration of Mongolian culture and history held in the world since the days of the Mongol Empire. The design of the Festival of Mongolia project shone a light on many facets of Mongolia's rich cultural heritage. The Festival of Mongolia programs included performances by Mongolian musicians, dancers, singers, contortionists, folk artists, feltmakers, champion wrestlers, archers and an exhibition of Mongolian dinosaurs specimens at the American Museum of Natural History, an exhibition of Mongol Empire historical artifacts at the Metropolitan Museum of Art. Central to the Festival of Mongolia concept was the two-day Naadam festival celebration held on May 19th and 20th in New York City's Central Park. 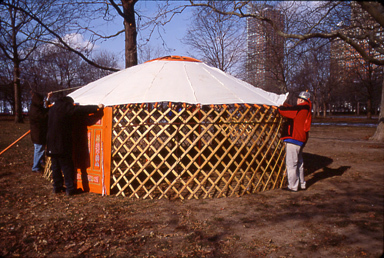 The Central Park Naadam was the first authentic Mongolian Naadam ever held in U.S. with participation by professional champion Mongolian wrestlers and archers as well as musicians, dancers and singers from Mongolia. The planning and execution for this project presented a great challenge for Aziz Rahman, the director of the Festival of Mongolia and the partner cultural institutions to bring together the present-day living culture of Mongolia as well as Mongolia's rich cultural and historical heritage on an unprecedented scale. The Festival of Mongolia's inter-connected design of Mongolian cultural programs and exhibitions required planning and coordination with some of New York's greatest cultural institutions in a timeframe that could accommodate a great number of simultaneous presentations and public programs around the city. Legendary Central Park in New York City was the setting for the Festival of Mongolia's introduction of the first authentic Mongolian Naadam celebration ever held in the United States. Naadam in Mongolia is the main annual cultural event comprised of championship Mongol wrestling, horseracing and archery competitions. The Central Park Naadam took place on a large grassy field with many tents and several Mongolian Gers of different sizes encircled around the site around it giving it the feel of a Mongol nomad camp. Six champion wrestlers from Mongolia took part in the exhibition-wrestling matches that were complete with zazuls (wrestler's heralds) referees and ancient Mongol traditional wrestling rituals including the symbolic eagle dance. Mongolian wrestlers raised the Mongolian flag while the national anthem was played and then a procession of singers, musicians, dancers, archers and the wrestlers circled the field. Mr. Ganbold, advisor to the Prime Minister, explained the significance of the traditions and rituals, of the various sports and performances demonstrated for the audience. As Mongolian tradition dictates, the Naadam performances began with Mongolian horse-head fiddles playing and khoomi throat singing. Songs reserved especially for such auspicious events were performed. Four wrestling champions from Mongolia then paired off for series of elimination matches till the final round of the two remaining wrestlers. The wrestling demonstrations were exciting with many complex throws and wrestling maneuvers executed to resounding applause from the audience. Two zasuls, who are the wrestler's coaches and representatives, exhorted their charges to compete vigorously. Dancers took to the field and performed from a repertoire Mongol folk dances including a Mongolian shaman dance and one piece in which the dancers imitated a feisty Mongolian horse. Dance forms from several regions of Mongolia were demonstrated with musical accompaniment and a variety of colorful Mongolian costumes. The archery team comprised of a man, a woman and a girl archer then introduced the famed Mongolian recurve bow made of sinew and horn to the audience. Traditional targets, leather cups placed on the ground, were the targets at a distance of fifty feet and sixty feet. 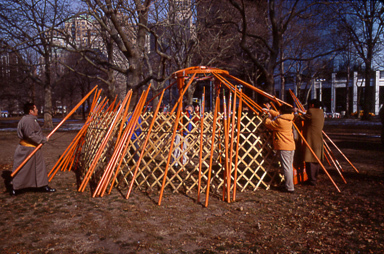 The Mongolian archery demonstrations were the arranged with special permission from New York City's Parks Departments and were the first-ever archery competitions held in Central Park. 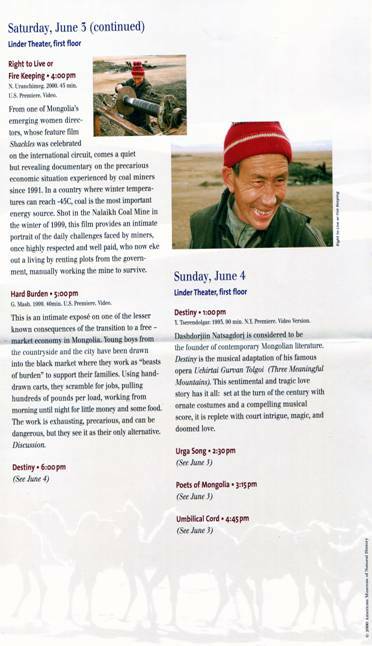 The key partner for the Festival of Mongolia in 2000, the American Museum of Natural History, presented a series of public programs on Mongolian culture. 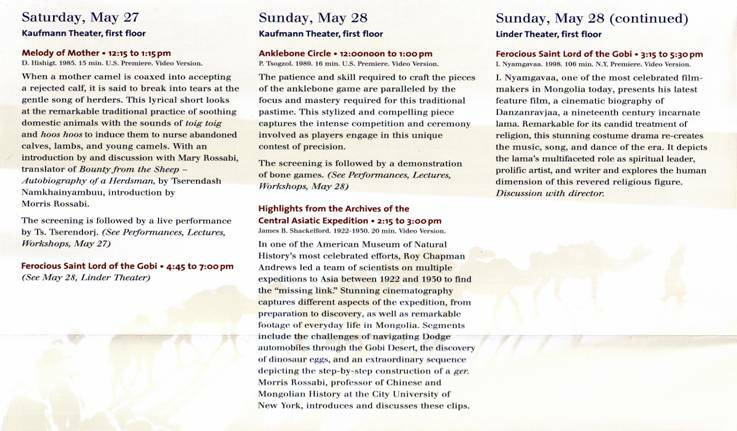 The American Museum of Natural History - Festival of Mongolia programs comprised a broad range of focus combining paleontology and photography exhibitions, film screenings, education and anthropology seminars, and cultural performing arts events. pastoral-nomadism that is the practice of more than half of the Mongolian population. Prof. Goldstein displayed a series of striking photographs of the landscape and nomadic life in Moost Province in Mongolia. The teachers were then given a guided tour of the Guide to the Hall of Asian Peoples, focusing on a display of Yakut Shamanism, another showing the lineage of the Mongols from Chingghis Khan to the Mughals in India. A few sections of the gallery drew attention to Russian influence in Asia and the tribes of Central Asia. Teachers also received a bound copy of a Mongolia study course book with lesson plans on Mongolian history, culture, and biodiversity prepared by the American Forum for Global education. A film about the life of a Mongolian camel was shown, and the teachers visited the museum's moveable museum and its displays of three nomadic peoples including the Mongols. In discussion with the teachers much was learned by the designers of the program of the range of knowledge that the teachers had about Mongolia generally. The teachers spoke about ways to help their students expand their understanding of nomadic cultures and Mongol history. Also noted was the need for visual aids such as slide images, videos, and where possible the Internet to engage students. A class of ten students also attended the session and agreed that they would prefer events based learning and visual supplements to the instruction when possible. 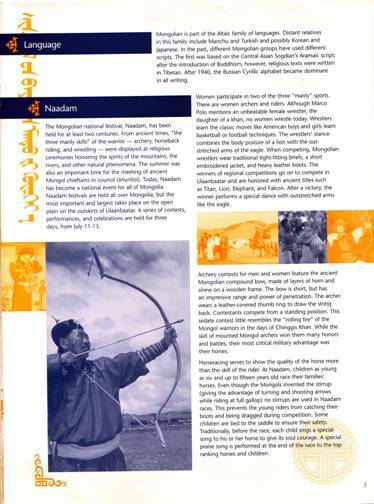 The Education Department of the American Museum of Natural History created a special Teacher's Guide to the Festival of Mongolia which included information about Mongolian history, language, culture, as well as information about educational resources and exhibits at the museum with educationally relevant information about Mongol cultural history. The renowned Margaret Mead Film & Video Festival presented a special program of Mongolian films for the Festival of Mongolia programs at the American Museum of Natural History. The Mongolian films selections ranged from the most recent works to period classics. Films from Mongolia's period of Soviet influence provided contrast with others that reflected modern day Mongolia. The films ranged from historical epics on a grand scale to experimental short works. Mongolians close relationship with their land and animals was depicted in a famed classic titled Melody of Mother. This short film showed the Mongolian herdsman's techniques for soothing abandoned young lambs, calves and camels. The Mongolia Now: Independent Voices films screening were followed by a discussion about the films with Mongolian filmmakers and the audience. Archival footage of the museum's 1920's expeditions to Mongolia was shown in a compilation of film highlights. This documentation provided one of the earliest glimpses in Mongolia's ancient culture and provided an understanding of the museum's long relationship with Mongolia. The pioneering work of Roy Chapman Andrews and his discovery of dinosaur eggs and other specimens commenced a period of great paleontological discoveries in Mongolia. A recently made Mongolian film titled, Ferocious Saint Lord of the Gobi told the story of a renowned Mongolian lama. By depicting the famed lama's human dimensions the filmmaker allowed the audience to gain insight into the life of a complex and gifted Mongolian saint. Other films including Poets of Mongolia, Urga Song, and Hard Burden illuminated the difficulties in transition from the Soviet period. The social and economic changes faced by artists and laborers are borne out in these works. The directors of some of the films were also present for the screenings and their personal perspectives added to the public's understanding of these works. programs for New York City schools for the Festival of Mongolia. 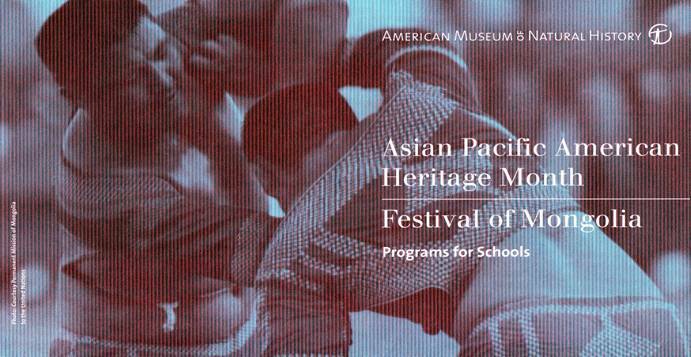 These events were presented as part of New York City's Asian Pacific Heritage Month celebrations. Exhibition of paintings by the legendary Nicholas Roerich in an exhibition titled, Mystical Visions of Mongolia. Nicholas Roerich Museum for the Festival of Mongolia program. Tibet comprise this remarkable exhibition. displays artifacts where the Mongolian horse has been represented, in particular in the art of the Ilkhanid Empire. these animals and other endangered species in Mongolia. Images, the Mongolian Altai and the U.S. Southwest. aspiring Khoomei singers on how to develop their throat-singing abilities. component of the Asia Society's celebration of Mongolian culture. manufactured in Mongolia and meet with their American counterparts. The Festival of Mongolia co-sponsored the annual N.Y. Urban Park Rangers Falconry Extravaganza on Central Park's Great Lawn. The Festival of Mongolia partnered with the Wildlife Conservation Society to publicize the ongoing conservation work being done in Mongolia. Mr. Done Moore of the W.C.S. Central Wildlife Center joined Ambassador Enkhsaikhan and N.Y. Parks Commissioner Henry Stern in speaking about Mongolian conservation issues and distributing literature about the current species protection programs in Mongolia. The festival organizers set-up a Ger the round nomadic home that Mongolian herders still use in the countryside. 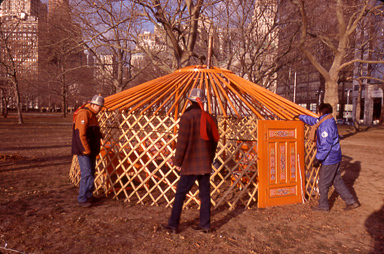 Hundreds of New Yorkers visited the ger and saw the interior with its traditional furnishings and met with Mongolian who described the everyday traditions of the Mongolian nomads. This event drew an estimated 10,000 people who witnessed various types of hawks, eagles and falcons demonstrate their flying and hunting skills. A type of hawk that is also found in Mongolia was featured in the program as well. On November 6th, 2000, the Festival of Mongolia organized a follow-up meeting with the teachers who were participants of the April 1st teacher training program. Prof. Paula Sabloff presented a lecture titled Democratic Principles of Mongolian Society. Teachers exchanged views on how to make the Mongolia component of their Global History course more successful. Many teachers expressed interest in the continuation of the program by adding more focus on Mongolia's culture and its environment. It was decided that an essay-writing contest should be organized for high school level students with one of four topics about Mongolia to be chosen for the essay by students. The Council Foreign Relations hosted a panel discussion addressing Mongolian contemporary affairs issues titled Strategy of Survival: Mongolia's Quest for Political & Economic Security. The speakers included, Dr. Sanj Altan, President of the Mongol-American Cultural Association, Ms. O. Enkhstetseg, Director of the Multicultral Cooperation Department of the Ministry of Foreign Affairs of Mongolia and Professor Morris Rossabi, visiting professor at Columbia University. Topics for discussion included difficulties encountered in transitioning to the market economy, foreign aid and investment. Other issues discussed included regional economic dynamics, and the threats posed to wildlife by development. A series of lively discussions followed the presentations with questions and statements by members of the audience. Dr. George Schaller director of the Wildlife Conservation Society's international programs spoke to an audience of longtime donors and trustees of W.C.S about the society's work in Mongolia. Along with information about the snow leopard, Gobi bear, wild camels and gazelles Dr. Schaller identified challenges to conservation efforts and possible solutions. A reception followed in the Central Park Zoo gallery where a display of Dr. Schaller's Mongolia photographs were being exhibited.